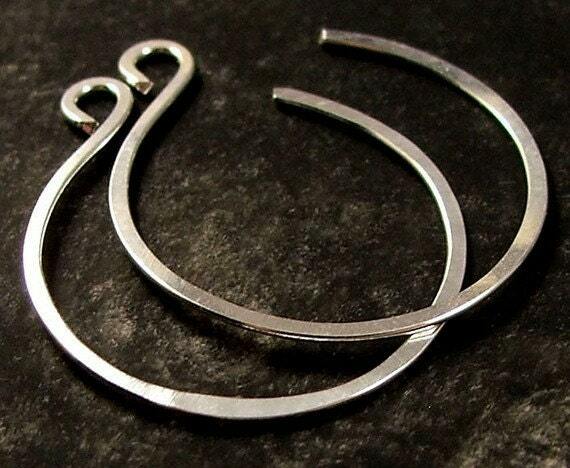 These wonderful lightweight small sterling silver hoop earrings are made from 20 gauge wire and then flattened. These thin backwards hoops are one of our Favorites. I have been selling these beauties on Etsy since 2009! These hoops are super comfortable, making them the perfect pair of hoops for an on the go woman. They are so simple and unique, that your friends will be asking where you bought them. These earrings have a classic style with a modern twist that is completely feminine. One of the best features of this unique design is that there is no clasp to mess with or to pinch your earlobe. Since the earring is a one piece of metal creating the hoop, there is also no backing to lose in the carpet! My hoops so lightweight, they are some of the most comfortable earrings I own. They weigh less than an ounce together. This earring has a diameter of 0.8 inches or 2.0 cm. Other sizes are available. These thin reverse hoop earrings are designed for a standard piercing. This means they are not heavy enough or thick enough to tear or stretch your earring holes as you wear them. I guarantee that these hoops are made of 100% Sterling Silver wire. Unlike silver plated wire, sterling silver will never flake off to expose a base metal. So how to you wear a pair of no clasp hoops? These hoops are inserted into the rear of your earring hole. Then by gently tugging the earring through your hole the round knot on the end of the hoop will catch and hold your hoop in place. I named these earrings Reversi Hoops, because they are a backward design from normal hoops.